The developers behind the Cydia Store have certainly upped the ante in the last couple of months. With Comex’s JailbreakMe exploit bringing thousands more to the jailbreak community, the supply has certainly increased with the demand. The Tweak Week challenge, which was introduced by experienced dev Ryan Petrich in early June, works like a radio takeover – one dev per week takes the helm and releases one app a day for seven days, and it certainly brought out the best in the participants and brought forth a host a useful tweaks for the millions of jailbroken iDevice users. 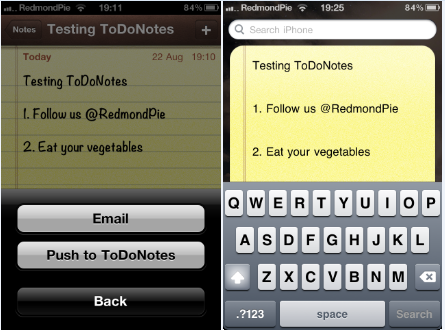 Today we feature a handy app developed in the midst of Tweak Week called ToDoNotes. What I like about this app is that it simplifies one app whilst giving use to another. For me, a to-do list is something that should be as easily accessible, as if you had a pocket notepad and pencil. In the same breath – and I know I’m not alone in this – I cannot see any real use for Spotlight search. Fair enough, it can help you quickly locate applications and do a quick Google search, but if you keep your SpringBoard organized, you will not have such woes. This tweak gives you a reason to use Spotlight rather than just over scrolling onto it by accident as it allows you to add a to-do list on it. It doesn’t take a genius to operate, and is a handy free alternative to many of the pricey apps on the App Store. As I said, it’s as easy as pie to operate; Simply tap the little envelope toggle in the Notes app, and opt for “Push to ToDoNotes”. Easy! Before you get on with ToDoNotes, you need to have a jailbroken iPhone with you. You can follow our step by step guide posted here to jailbreak your iPhone, iPad or iPod touch on iOS 4.3.5 using Redsn0w (or PwnageTool), or on iOS 4.3.3 using Redsn0w, PwnageTool, Sn0wbreeze & JailbreakMe (that last one being the easiest). 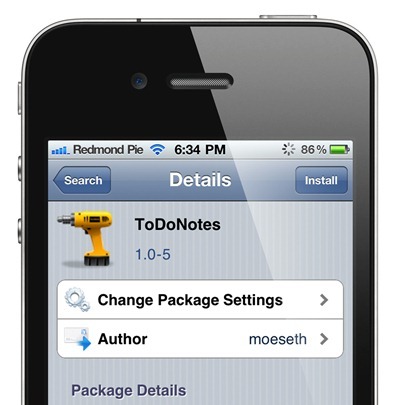 ToDoNotes is a free tweak available over at the BigBoss repo.